Mathematician Prof. Dr. Michael Rapoport has been awarded the 2013 Karl Georg Christian von Staudt Prize. With this prize, the Otto and Edith Haupt Foundation at Friedrich-Alexander-Universität Erlangen-Nürnberg (FAU) recognises Prof. Rapoport’s groundbreaking achievements in the field of arithmetic geometry and further mathematical fields. The prize is endowed with 25,000 euros and awarded every three years. 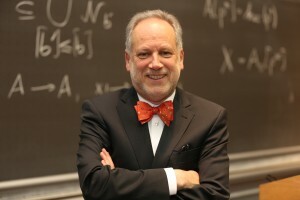 Thanks to his comprehensive mathematical understanding and his ability to apply highly sophisticated techniques from modern algebraic geometry and automorphous forms, Prof. Rapoport has achieved pioneering work in several areas over the last decades. Prof. Rapoport, who has been Professor for arithmetic algebraic geometry at the University of Bonn since 2003, first became famous for his studies on Shimura Varieties and proof of the Langlands conjecture for local function fields, which he achieved together with two fellow mathematicians. This earned him the Gottfried Wilhelm Leibniz Prize in 1992. Prof. Rapoport’s academic career started in 1976 when he finished his doctorate in Paris. Subsequently, he worked as a research fellow at Humboldt University in Berlin and held professorships from 1982 onwards at the universities of Heidelberg, Bonn, Wuppertal and Cologne. The Staudt Prize is awarded by the Otto and Edith Haupt Foundation for groundbreaking achievements in the field of theoretical mathematics. The prize will be awarded for the seventh time this year. It is named after scientist Karl Georg Christian von Staudt, who earned his doctorate at Erlangen where he was also appointed Chair of Mathematics in 1835. Von Staudt is one of the pioneers of projective geometry.